Back to Tyneside In 1871, aged 30, unmarried and born in North Shields, John Hopkins, who was to marry Sarah Ann Courtney in 1882, is an Engineer on board the Sir George Grey, a steam-tug. On the night of Sunday April 2nd 1871 - census night - the Sir George Grey was moored alongside Morpeth Dock Wall off Birkenhead, St Mary's Parish. The schedule however was not delivered to the Master - John Butler - until the 5th April when the tug was off New Ferry on the River Mersey. Three members of the crew, including the Master, were not on board on census night; present with John Hopkins were two stokers, George William Webster and Joseph Hulmston. John had arrived on Merseyside by 1861. In this census he is an Engine fitter living as a lodger in the household of James and Jane Johnston in Queen’s Buildings, Bebington. James Johnston is a ship carpenter born in Hebburn, Durham; his wife Jane, like John, was born in North Shields. James and Jane have six children alternately born in Hull and Liverpool suggesting the itinerant nature of his work. In 1851 John Hopkins, aged 9, is living with his widowed mother in Tyne Street, North Shields. Alice is aged 43 and a washer woman, and living with her are Charlotte and Margaret Coe, her two daughters from her marriage to Thomas Coe; Sarah Hopkins, who is her step-daughter, the daughter of her husband Thomas Hopkins from his first marriage to Ann Coxon; and John, Alice and Thomas Hopkins’ son. They all have Willington Quay as their place of birth. Thomas Hopkins was the son of Charles Hopkins a mariner and native of London living in North Shields who married Elizabeth Downey in Tynemouth on 30th October 1803. Born in 1805 in Tynemouth he married first Ann Coxon in 1827, and then Alice Coe (née Johnston) in 1839, and it was their son John Hopkins, who, born in Chirton, North Shields on the 15th September 1841, settled on Merseyside. Thomas Hopkins of North Shields I know we probably don’t share this family’s genes, but we do at least continue the name which is more than can be said for most of the descendants of Charles and Elizabeth who were producing children in North Shields at the very start of the 19th century. Actually they don’t have that many descendants at all as their success in producing children that survived was not replicated in subsequent generations. I went back to researching them recently just in case new material had become available, and a hunch paid off. I’d always wondered about Thomas Hopkins, a shipwright, who was the father of the John who crossed the country to work on the Mersey. Charles and Elizabeth had two sons called Thomas: one baptised on the 19th January 1806 and the other baptised on the 10th January 1813. In the normal run of things you assume that the first named child had died; but if that was so, was it likely that a Thomas Hopkins born in 1812/13 would marry his first wife in 1827 when he was 14 and she was 23 (in spite of the folk song!) The Merchant Seamen records include a Thomas Hopkins born in North Shields in 1805, who went to sea as a ship’s carpenter and who apparently dropped out of the records in 1843. His wife, Alice, is a widow in 1851, and their last child was born in 1841. So I needed to find a death in the 1840s. 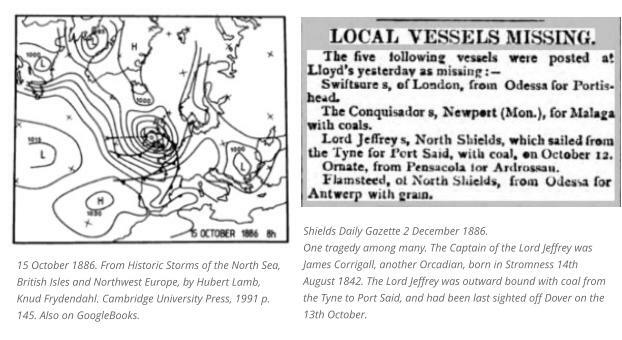 I knew it wasn’t registered in Tynemouth, but as he sailed on coasting vessels, it could have been another port. FreeBMD threw up some possibilities, but it was the Hull burial records on FindMyPast that clinched it. The Thomas Hopkins who died there in 1843 was 37 years old, and resident in Myton, where the infirmary was. Hoping that he wouldn’t turn out to be a local grocer, I sent away for the certificate. Thomas Hopkins died from a fever on the 12th July 1843 in the Myton Infirmary in Kingston-upon-Hull. He was 37 years old and a Shipwright. His death was registered by the House Surgeon, in attendance, John Higson. So while never being 100% certain that this is him, it does seem to be extremely likely! But it does also throw up a lot of questions about the Hopkins family in North Shields that I thought I had already answered: such as, who was the second Thomas Hopkins baptized to Charles and Elizabeth in 1813 ... George Lovel and the loss of the SS Flamsteed George Lovel’s mother was Margaret Coe, Alice Hopkins’s daughter from her first marriage to Thomas Coe. George and his mother are living with Alice in North Shields in both 1861 and 1871, with his cousin John Stoker, the son of Alice’s other daughter Charlotte Isabella Coe. In 1881 (census taken on the 3rd April) it is just George and his grandmother living at 5, King George Stairs; George is 23 and a steamboat fireman. He is listed as a fireman in the crew list of the steamer Tynemouth Castle from the 7th April to the 1st September 1881 under Captain John Harvey. The newspaper reports show the ship’s progress from the Tyne - cleared Newcastle on the 8th April - to Constantinople (Istanbul), Nicolaieff (Mykolaiv in Ukraine on the Black Sea), Malta, Antwerp, Venice, Panderma (Bandirma in Turkey on the Sea of Marmara), Constantinople, Panderma, Malta, Rouen, and back to the Tyne on the 31st August. Though this is the only crew list available to check easily on line, judging from the sheer amount of shipping from the Tyne following this and other routes, George, as an experienced fireman, would not have been short of work. 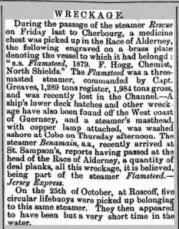 His name does however appear on another tragic crew list that was published in the Shields Daily Gazette of the 27th October 1886 on the occasion of the loss of the SS Flamsteed. Captain: John Robertson, Victoria Street, Stromness Mates: J.M. Henderson, 9 Hopper Street, North Shields G.A. Taylor, 177 Linskill Street, North Shields Engineers: John B. Stothard, 101 Cuthbert's Terrace, North Shields, chief J.T. Skinner, 5 Albion Road, North Shields, second Henry Davis, 61 John Street, Commercial Road, London, E.C. 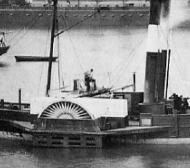 Crew: Louis Kullendborg, Wellington Place, South Shields, carpenter Thomas Thompson, 5 Thompson Street, Liverpool, steward F. Wilson, 87 Henry Street, South Shields, boatswain Thomas Craig, 2 Palatine Street, South Shields, A.B. Geo. Anderson, 132 Maxwell Street, South Shields, A.B. Alex. Miller, 67 Wellington Street, Dundee, A.B. Chas. Pottinger, 9 Tyne Street, South Shields, A.B. J. Peters, Sailors' Home, North Shields Jas. Robertson, 7 Denmark Street, South Shields, O.S. Francis Hall, 26 Church Way, North Shields, A.B. Jno. Ferguson, 25 Linskill Street, North Shields, A.B. Geo. Pett(? ), 14 Edith Street, South Shields, A.B. Abel Dunn, 58 Noirth King Street, North Shields Thomas Turnbull, 9 Front Street, Milburn Place, North Shields, donkeyman Firemen: George Short, 43 Tyne Street, North Shields J. Travener, 42 Linskill Street, North Shields John Balmain, 26 Garden Street, North Shields George Lovel, Union Quay, North Shields Ormond Hutchinson, 4 Duke Street, North Shields Henry Henderson, 26 Little Bedford Street, North Shields J.R. Lawson, 39 Camden Street, boy The Captain John Robertson, an Orcadian, was accompanied by his wife, which brings the total to 28 lives lost. Another crew member, James Robertson, was also from Orkney, and according to his death notice in the Shields Daily Gazette of the 31st December 1886, “he was the eldest son of Robert and Jane Robertson, of Stromness, and grandson of the late Matthew Harrison, pilot, of South Shields, age 20 years.” The Flamsteed had returned from Bombay in April 1886. The current voyage had seen her go via Aden to Karachi where she arrived in July. Returning via Savona in Italy, she then went to Odessa, leaving there with her load of grain on the 28th September, and arriving at Malta early in October. She was expected in the English Channel on about the 15th October, but never arrived. A hundred and one years later to the day (15/16 October 1987) another severe storm (but not a hurricane!) battered Britain and the south-west approaches to the English Channel. Reading through the shipping news in the local Shields’ papers it is easy to imagine the families of the seamen poring over the columns in a similar fashion to follow the progress of their ships. Which makes the announcements of the discovery of small items from the Flamsteed all the more poignant. 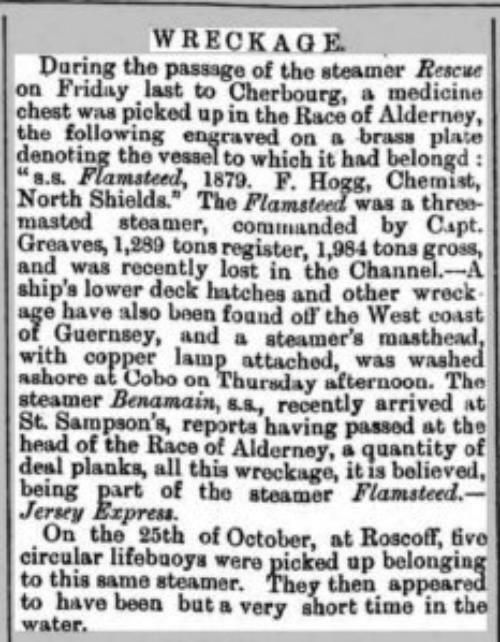 A medicine chest from a chemist in North Shields, some lifebuoys, a box containing private and shipping papers and £25, and various pieces of wreckage were found in and around the Channel Islands and on the north-west coast of France. The position of the wreck itself has never been located. Click to enlarge The Star - Saint Peter Port, Guernsey, 25 November 1886. They seem to have got some of the details confused.